The physical therapist who is helping Daddy recover from hip replacement surgery asked the other day, "Who is into these leopard prints?" My mother answered with a smile, "I am." He was in my parents beautifully decorated bedroom and couldn't overlook the leopard spots on the rug borders and a leopard or two or three on prints and ceramics. Animal prints are best used as accents and they really do go with anything. So when I needed a striping fabric for this utility quilt made of discontinued fabric samples, I sought out a leopard print. The quilt is a gift for my parent's wedding anniversary. 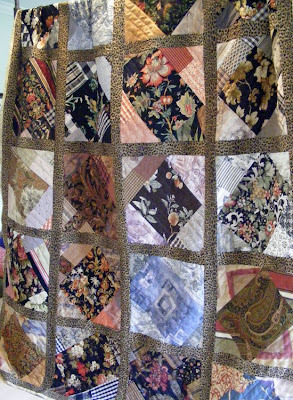 Mother wanted something larger than her inherited quilts - all made for double rather than queen beds. Since I love a huge variety of fabrics in a quilt, using discontinued fabric samples really fits that need. There are very few duplicates here. The biggest challenges are fabric prep and the irregular sizes. These types of fabrics aren't really meant to be washed and they shrink heavily. So I handwashed each piece in hot water and then dried them in the dryer to insure they wouldn't draw up after the quilt was finished. Also these types of fabrics really ravel. So when I took the pieces out of the dryer, I often had a thread entangled mess to sort out. When fabric samples are made, the sampling company is cutting up pieces from a regular run of fabric into specific sizes for sampling. Unlike what I do when I make window treatments or pillows, they don't worry about centering the pretty flower design in the middle of the fabric. They need to get as much out of a piece as possible. So often the flower or the animal as in some of these prints, gets partially chopped off. This must have been what it was like when quilters truly used scraps to make their quilts. 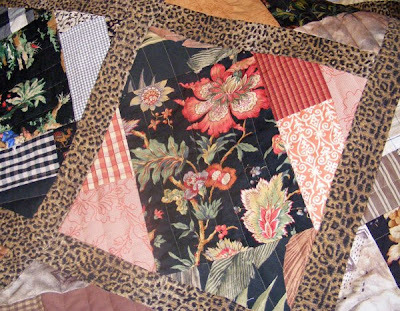 If you are working with left over sewing scraps from a shirt or dress, you have to cut out your quilt designs from what you have. We are spoiled today with endless beautiful prints in large enough pieces to create whatever we want. This is my third discontinued fabric sample quilt. I've enjoyed the challenges. My Mother really loved the quilt. She keeps referring to it has her bedspread. I hope it will provide warmth, too.